"The College of New Rochelle hosted Sonia Kovalevsky Math Day, a day of workshops and group problem solving activities on Friday, Oct. 10, to inspire girls’ interest in mathematics." summarizes Alesha Hanson. Approximately 50 young women from Academy of Our Lady of Good Counsel in White Plains and The Academy of Mount Saint Ursula in the Bronx participated. Sonia Kovalevsky Math Day is a day of workshops and group problem solving activities to inspire girls’ interest in mathematics. The college has hosted this event annually since 2008. The day’s events included morning workshops on cryptography, blood splatter analysis, adventures in chemistry, and graph theory. After lunch, there was a problem solving contest, a game show activity, a panel of CNR students who discussed their transition to college and life as college math/science majors, and lastly prizes for expert problem solvers of the day. Math Day activities, sponsored by the Mathematics Department, were led by math and science majors with supervision from faculty advisers Michelle Merriweather and Michael Gilliam. 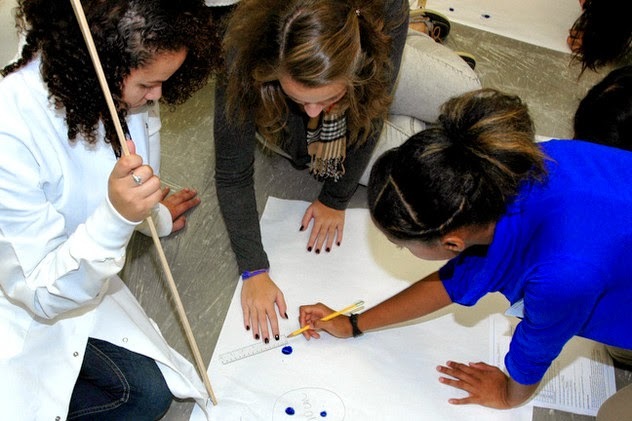 “Math day at CNR is a wonderful chance for young women to witness math in action on a college campus," said Merriweather, associate professor of math.